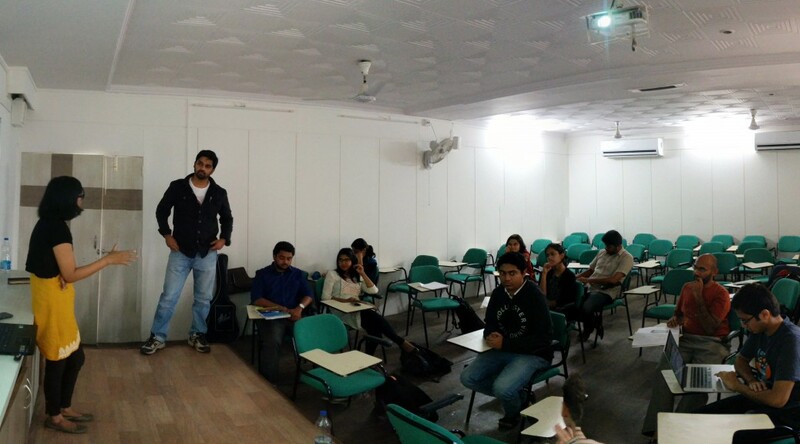 On the 16th of January, we hosted the fifth Datameet event for the Pune chapter at the Symbiosis School of Economics. The focus in this event was more on enabling discussions and initiating collaboration, so a Roundtable format was selected with three main speakers: Padmaja Pore from Door Step School, Jinda Sandbhor from Manthan Adhyayan Kendra and Nikhil VJ (Centre for Environment Education). The session started with everyone introducing themselves. 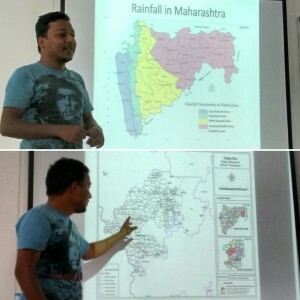 After that, Craig — co-organizer of the Pune chapter — talked about what Datameet is, how it started, and the aim of city chapters. 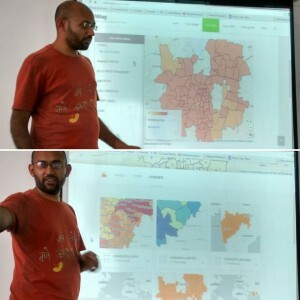 He then explained how the Pune chapter is focused on connecting data-enthusiasts from various disciplines — such as NGOs, Data Analysts, Engineers and Designers — to help collaborate and spread more awareness about how data can be used. The roundtable started with Padmaja Pore introducing Door Step School, an NGO that runs several projects around primary education. One such project is Every Child Counts (ECC) that was started in 2011 and focused on ensuring that every child goes to school at the right age of 6-7 yrs. Through ECC, Door Step School seeks to understand and address barriers to the schooling of kids of migrant communities such as those engaged in nomadic professions,workers at construction sites, factories, brick-kilns, etc. in the vicinity of Pune city. When parents move their home several times in a year itself, how can it be ensured that their kids remain enrolled in schools? In India, there are more than 1 million kids out of school (18 million in Southern Asia and 69 million globally). The Right to Education Act has ensured that free and compulsory education is available, but no systematic process of finding and enrolling out-of-school not been actively implemented, with no definite count of the number of migrant children denied education. Surveys have been focused on children already working/street children, whereas the need is to focus on children who are 6-7 years old so that they are enrolled into schools before they get drawn into employment. There have been no active steps to put in processes at schools for ensuring migrant children can transition smoothly to another school when they migrate. .
2.Preparatory camps: Through the medium of preparatory camps, awareness is spread amongst parents of children on the importance of schooling. After working with the children, the team realized that these kids are not aware about the concept of formal education, and are not used to sitting at one place for a few hours to study. Thus the focus in the preparatory camps is on interactive activities to get kids more accustomed to the environment. 3.Admission/ Enrollment: The children and parents are accompanied to a local public school and assisted with the enrolment process. Parents are made aware of the provisions of the RTE act. Currently the data is collected using a mobile app based on ODK (Open Data Kit) & KoboToolbox/ONA. The team is developing a Web based Platform for scaling the ECC Program pan-India and engaging NGOs and CSR groups in this cause. One of the key features of this Website is envisaged to be to engage volunteers actively with children to help motivate, enroll and track their continuity for larger impact. Padmaja then talked about the way forward and the challenges they were facing w.r.t developing the ECC Platform as well as actually reaching all children in the project areas. No formal source available for school locations, hence data is still partially incomplete and dependent on crowdsourcing of school locations. Create more interactive maps and chart visualizations, showing schools, sites etc (heatmap or other suitable format) for providing an aggegation/ disaggregation of data on migrant children. This can help in advocacy efforts. Explore ways to track migrated children Find ways to dynamically update the databases and see changes in map/chart visualizations after a volunteer makes an entry on the mobile survey form. After the talk, everyone pooled in with their ideas and suggestions such as connecting with Trekking communities to pair up as volunteers to reach out to any schools/kids on the outskirts of the city, and collaborating with initiatives like Sagar Mitra (Recycling plastic). Few problems were taken up by individual attendees for further discussions, like finding ways to automate the data entry into excel which is done manually right now. Interested attendees were requested to volunteer and also reach out to their community to spread the word. 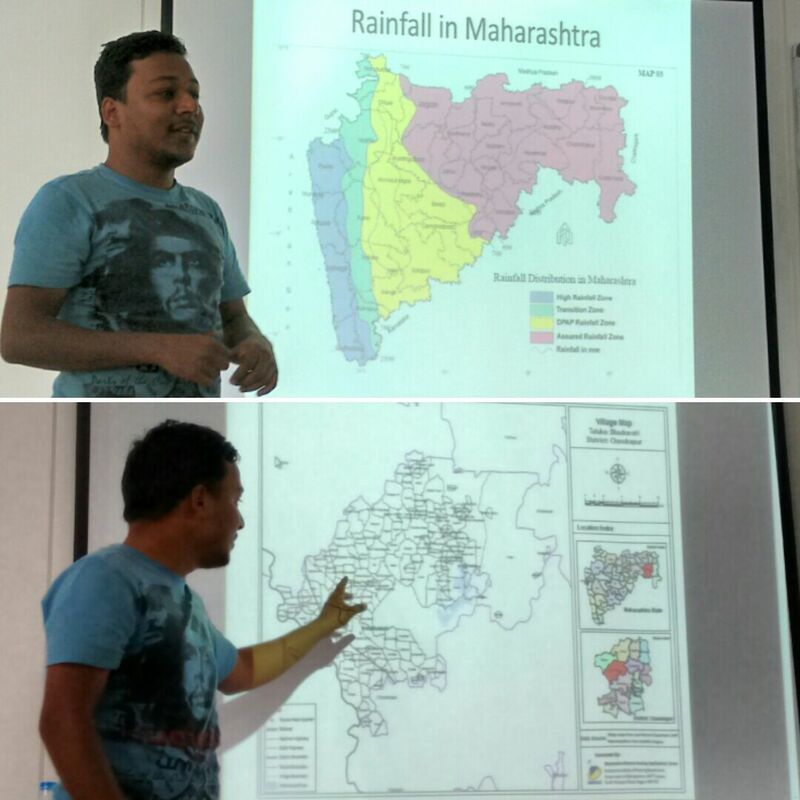 For the second talk, Jinda Sandbhor from Manthan Adhyayan Kendra spoke about village level mapping of tanker water supply in Maharashtra. With 14,708 drought affected villages in 2015 and 148 drought prone blocks, there is an immediate need for collecting data to analyze the reasons for drought and what can be done to better prepare for the future. various months in the past few years. Jinda highlighted his efforts to collect village specific data in some districts on the reason for request of the tanker. He mentioned that there is need for a village-level base map for Maharashtra that can help visualize and analyze this issue. The discussions after this talk were focused on GIS related topics, with everyone agreeing for the need for detailed village level maps. While there are village level maps available in PDF as well as as a Web Map Service by Bhuvan, these need to be converted into shapefiles so they can be used for further analysis. This will enable visualizing with great accuracy, not just drought related data but any number of socio-economic parameters of Maharashtra for analysis. It was also recommended to connect with Prof. Ashwini Chhatre from Indian School of Business (ISB) who has been working on Millets & Irrigation data and would have more detailed maps of the state. Another suggestion was to use GIS to take Land Revenue maps and convert into public-domain data. The third talk was by Nikhil VJ who is the co-organizer of the Pune Datameet chapter and has been working on multiple data-centric projects. He also showed his work on cleaning and mapping Pune’s Budget sheet, which was originally available as a 600 page PDF and now has been converted to excel and cleaned up considerably. The Pune Municipal Corporation has now agreed to bring in some reform in its budget book format and Nikhil & CEE are working on possible ways to take such tasks forward. Nikhil also covered several tools and methods described below that are easy for anyone to pick up and can help solve some interesting data-related problems. With this, the session was formally concluded.